The bridge is pleasing to the eye. It’s perfect in its simplicity. You can only appreciate the grace of its arcs from a distance, or from the pebbly beach down below. Looking up you see a figure standing on the topmost point of the arc. A man is waiting until the amount of money offered by spectators on the bridge reaches a certain point. Jumping is dangerous. If satisfied with the offering, he will jump into the Neretva River below the bridge. It’s a drop of twenty-four metres. The water is always cold. A young Australian man died last year when his body hit the cold water. Up above, the temperature had reached nearly forty-five degrees celsius. He died from a heart attack. 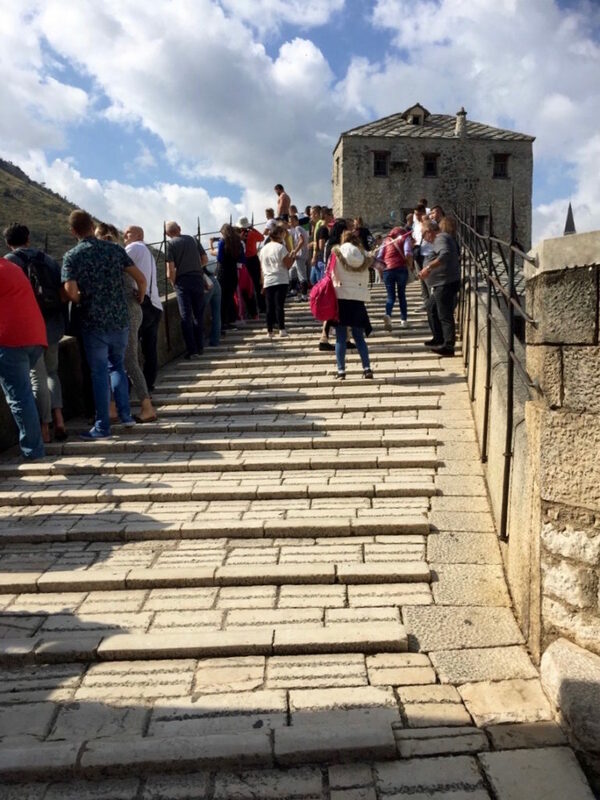 The Mostar Bridge is in Southern Bosnia and Herzegovina, a country today inhabited by 113,169 people. The bridge was destroyed by shelling in 1993 during the Croat-Bosniak war. 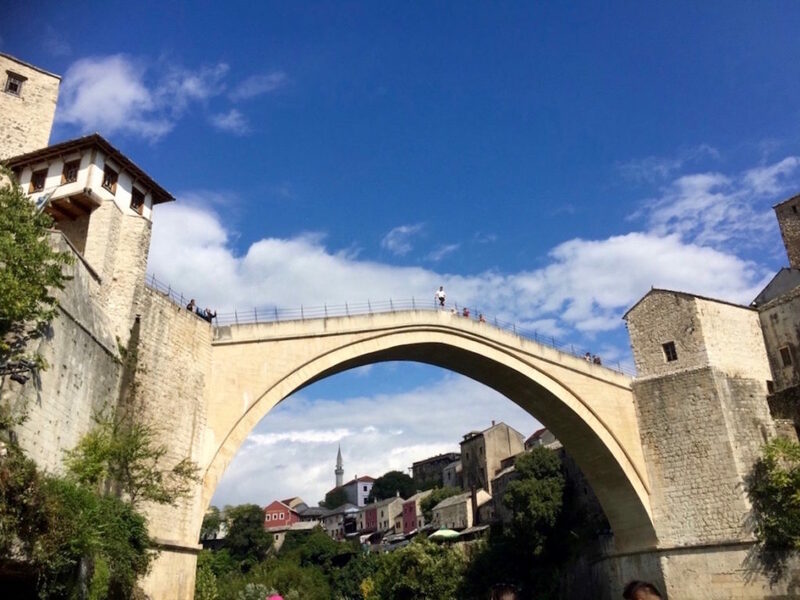 The Old Bridge, an Ottoman structure, stood for 427 years. Reconstructed with international aid, gathered by UNESCO after the war, it has become a World Heritage structure. It is constructed of 1556 stones. I first learnt about this bridge from a Bosnian refugee in Sydney during the nineties. He was giving a cultural talk in a Second Language class I was teaching at the time. 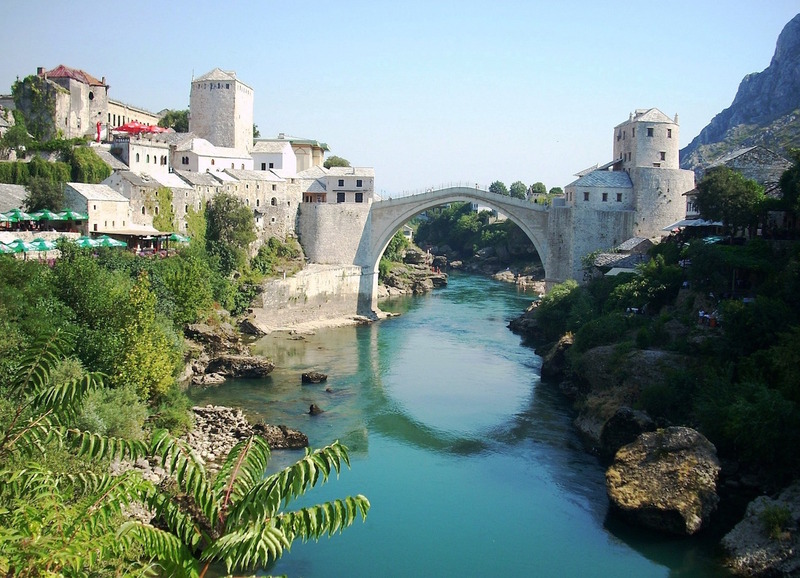 This inspired me to one day visit Bosnia-Herzogovina and see this bridge for myself. I got the chance this month while staying in Croatia, a three-hour bus trip away. We had to pass through three border stops, as a slim coastal strip belongs to Bosnia. The bridge is whole once more, but the people in Mostar remain split, torn asunder by trauma left over from the war. Moslems live on the east of the town, worshipping in mosques, while Catholic Croats and Orthodox Serbians are on the west. Healing takes a long time in these situations. The three entities tend to choose segregation rather than forgiveness at this stage. I love this story, such a well-written non-fiction piece. Fascinating tale of our young countryman and his unfortunate demise. More like this please!